The Many Mini-Adventures of the Wards: Lizzie turns SIX! Lizzie's birthday has come and gone, but we had so much fun - we had to write about it! Her actual birthday was packed with celebrations! She woke to a pile of presents, a doughnut breakfast, and a small family party before school. Lizzie chose to bring birthday brownies to share with her class at school that day. All the kids in her class sang a special birthday song and she got to wear a cute birthday crown. 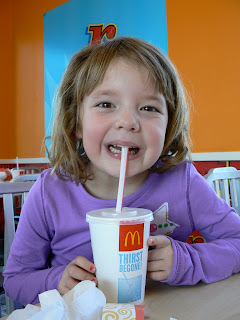 After school she chose McDonald's for her birthday lunch. And then for her date with mom and dad dinner she chose In N Out (melt daddy's heart with that choice!) before heading over to the Build-A-Bear Workshop. The day before her birthday, Gramma Elizabeth took Lizzie for a special shopping date. Lizzie got to choose 2 new outfits and several other birthday presents. (Note the cute yellow/polka dot top she's wearing above - yeah, that was one of her super cute outfits!) A big thank you goes out to Gramma for making her birthday even more special! 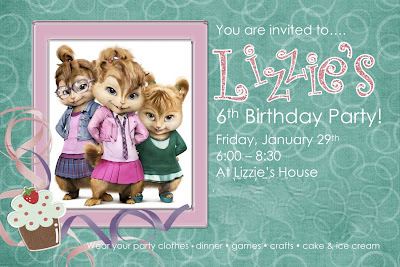 On Friday night, Lizzie had her friend party! It was a wild crazy time with 25 little friends over to celebrate. Lizzie loved the new Alvin and the Chipmunks movie, specifically the Chipettes. So, she chose to do a Chipette themed birthday party. What do you do at a Chipette themed birthday party, you ask? Well... we set up a stage, mike, and disco ball... and we were set! We turned down the lights and let the kids dance and sing to their hearts content. They also ate a delicious pizza dinner, crafted their own goodie bags, hit the pinata, and ate lots of cute cupcakes and ice cream! We finished off Lizzie's birthday celebrations with a combined Duran/Ward family party. We did cake, ice cream, and presents - easy peasy. It was so nice to have everyone there. Seems like we haven't gotten together in a long time and we all had a nice time visiting - glad for an excuse to get together. 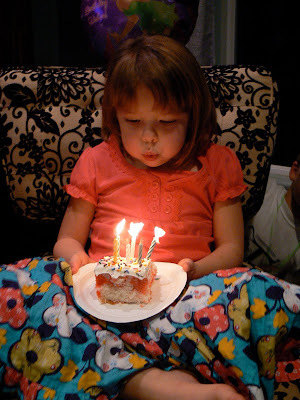 Check out that serious expression on Lizzie's face while blowing out the candles. That's all business - you make a wish and then blow out the candles. And you DO NOT tell your wish otherwise it won't come true. She was that intense every time we sang Happy Birthday. You are such a joy to our family. We love watching you make new friends, grow and learn. Happy birthday Lizzie girl! How many kids were at that party? Holy cow you guys are CRAZY! LOVE the stage,lights,disco ball, mic, etc. So fun. Happy birhtday LIZZY! i have to admit, birthdays around here are killer on the diet. cake, cake, cake, ice cream, and out to eat several times. whew! it's nice not to have to cook so much, but wow. diet begins as soon as the celebrations end! Thomas cant get over Lizzy's birthday day meals...donuts, brownies, mcDs, In n out...he has mentioned it about 3 times today. Lol.